This post may run contrary to everything you've ever heard or been taught about fire. On the left side of the photo is a man dressed in protective clothing, carrying a torch and a water tank. On the right are kids and parents watching, as if the fire were a magic show at the local library. Danger on the left, complete ease on the right. There are buildings, people, and fire in close proximity, yet no one seems concerned. What's going on here? 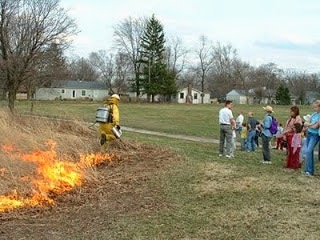 It's the annual prescribed burn that takes place in Buhr Park in Ann Arbor, Michigan, a few hundred feet from where I once lived. Thanks to the initiative and gentle persistence of an environmentally minded neighbor who runs a small daycare next to the park, and with cooperation from the city's innovative Natural Areas Preservation program in Parks and Rec, the park's broad expanse of turf is now dotted with three wet meadows that absorb stormwater runoff and are packed with native grasses and wildflowers. In the long ago, fire was nature's way of cleaning up last year's debris and setting the stage for new growth. In highly populated areas, or most anywhere a fire could spread, this once natural process must be recreated under controlled conditions. The broad lawns provide a convenient fire break and safe vantage point from which locals can watch the annual burning of the meadows. "Although burning may seem destructive, fire actually serves to stimulate vigorous new growth of native plants, control the invasion of undesirable plants, warm the soil and release nutrients. Fire allows diverse, native plant and animal communities to thrive in natural areas." The burning is done by professionals and timed for optimal beneficial effect. That it also makes a fine excuse for a family picnic in the park is a bonus. The native plants are all local genotypes, which I think initially came from plants no longer needed by a university student who was doing some research, so this project brought town, gown, and local citizens together. Here's more text from the email announcement, which I include here because it would be such a treat if Princeton's ecological awareness reached the point where such an activity could take place locally. Smoyer Park, out Snowden Lane, is particularly well suited, because it has ready-made depressions that could easily be converted into wet meadows, surrounded by expanses of turfgrass. The thin coating of ash after a burn makes an excellent seedbed, so seeds are collected before the burn, then scattered afterwards. "One parent says, "It's quite a sight - my daughter has gone to prescribed burns from age 2 and loves them. I think it's quite safe for kids of any age if they're with a parent." We'll scatter native plant seeds back on the meadows after the burn. Then In a few weeks the meadows will be springing back to life, better than ever. If the weather permits, consider bringing a picnic supper. Come and go when you like. The event is free and open to the public." I don't expect this sort of prescribed burn will happen in Princeton anytime soon, but if a more local model is needed, it is being done in meadows and oak forest at a preserve an hour north of Princeton. This link takes you to photos of those fires, and the beautiful parklike effect of the regrowth. For more on Ann Arbor's Buhr Park Children’s Wet Meadow Project, go to wetmeadow.org.